Home » Best Products » 5th Wheel Hitches – What Are The Best Options? Thinking of towing a vehicle but worried your standard ball hitch will not get the job done? You can rely on the best 5th wheel hitch to move a heavy load from point A to point B. 5th wheel hitch is a special kind of hitch built specifically to carry heavy loads ; something that a ball hitch cannot handle. It is designed in such a way that the load rests upon the bumper of a towing vehicle (truck) , the 5th wheel hitch helps to suppress the load while the towing vehicle moves. B&W is a huge player in the automotive accessories industry and the RVK3500 is one of their premium offerings. Compared to other hitches in the Companion series , the RVK3500 comes with features aimed at simplicity and user friendliness. For starters , the RVK3500 is a sturdily built 5th wheel hitch with an improved design that allows for easy attachment and removal when needed. The design eliminates the use of rails by replacing it with B & W gooseneck’s hitch mounting system which works with and without trucks that support gooseneck. In turn , this change in design provides more efficiency to your truck as you can easily use the truck bed for other functions asides towing. Installation is a breeze and you can do a full setup in 10 mins , although users complained this hitch is quite heavy , hence they needed a little help putting things together. Talking about weight , the RVK3500 5th wheel hitch is built to carry load up to 20,000 pounds , the highest rating of any hitch in the B & W companion series. Campers love this of this hitch as they relied on it to move their RV wherever they go , and it performed excellently. In conclusion , we think the RVK3500 is the best 5th wheel hitch on the market especially for those want to have the a great experience while towing. The height adjustment is better , the weight is higher , the foot pads of the hitch are now adjustable , and most importantly , it allows for other uses of your truck bed asides towing. The only complain we got is that the hitch itself is a little heavy and the price is at the high-end of the market. Other than that , you can rely on this best 5th wheel hitch to get the job done. Fits with all standard brands of gooseneck hitches. Features a patented remote latch/unlatch cable. Rated at 24,000 lbs GTWR and 4,500 lbs tongue weight. Made in the USA. 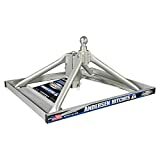 Andersen is a big heavyweight in the hitch industry and the 3220 is another solid option you can rely on. Andersen calls it their best 5th wheel EVER , and going by its features and the attention to detail in its construction , its hard to dispute this claim. 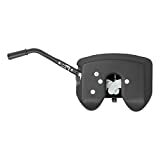 The strength of this hitch lies in Andersen’s patented ball-funnel construction which , compared to some hitches on the market , makes it very easy to hook up and disconnect when necessary. You can use the Andersen 3200 to carry anything because it has a maximum carrying capacity of 24,000 pounds which is one of the highest rated on the market. Talking about weight , this made in USA hitch is highly rated in the community for being lightweight and easy to use. Andersen claims the base of this hitch can installed or removed in less than 45 seconds while full installation can be done in less than 5 mins which is very impressive , i must say. Users love this hitch and had no issues using it. The only complain we got is that the safety chain is not included in the package which means you will have to buy it separately. At 24,000 pounds carrying capacity , you can use it to carry a lot of load. We understand 5th wheel hitches are expensive and not everyone has the financial power to invest is a high-priced product. 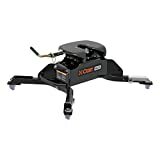 So if you’re on a budget but need the best 5th wheel hitch that gets the job done , Curt 16516 is a solid option you can rely on. The Curt 16516 E16 is a sliding hitch that comes with dual-pivot head which provides a smooth ride by allowing for only 10 degrees of lateral movement. With the hitch at your disposal , you can carry load weighing up to 16,000 pounds and vertical load of up to 4,000 pounds. As with most hitches , the Curt 16516 E16 is designed to be used on short beds and is perfect for 8′ beds , although the manufacturer warns it should not be used on trucks with bed shorter that 6′. Installation is simple and straight forward and with the help of the installation guide , you should have no problem with setup. The 16049 5th wheel hitch is one of CURT’s premium offerings and worth mentioning on the list of best 5th wheel hitch. It is very popular for its ability to tow “quietly” while offering a smooth ride as you move a load from point A to point B. This Curt 16049 Q25 is engineered with high quality materials and safety features to ensure safe towing. The design uses dual jaws that fully wraps the kingpin to reduce chucking and increase security. Once coupled to the kingpin, the head pivots and angles with your 5th wheel trailer, providing a smooth, quiet ride.